Bus Users Shropshire held a very successful meeting yesterday in Bridgnorth. Around forty people attended, many drawn from villages where the bus service is now minimal or non-existent. The meeting highlighted the substantial problems rural dwellers have faced since the withdrawal of the Shropshire Link service. We were reminded that prior to September 2008 the 141 Ludlow to Bridgnorth service ran four return trips a day. The 141 was one of the major casualties of Link. It now runs just once a day, allowing just 36 minutes in Bridgnorth before returning to Ludlow (1). And it no longer serves Ditton Priors. Several people from Ditton Priors attended the meeting. 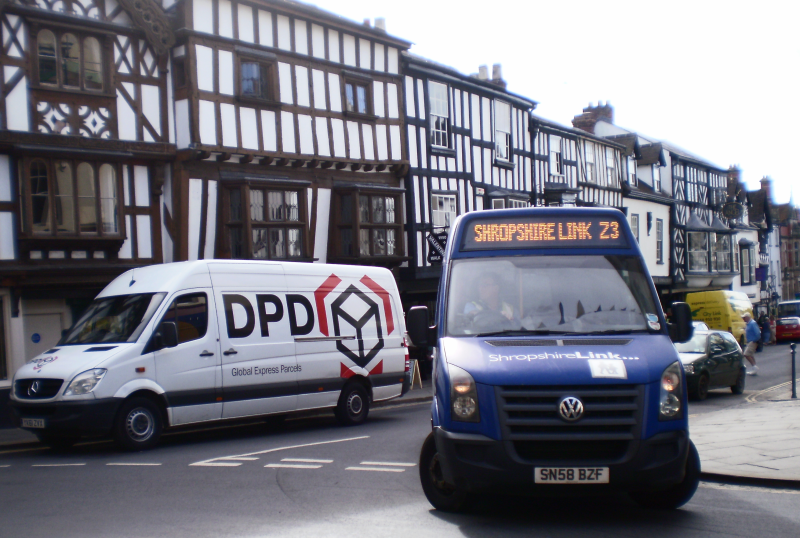 Since the cancellation of Link, the village is now only served by the pre-booked Bridgnorth Community Bus service. A young mother told the meeting that her children could no longer take part in school activities. Although she had received cancer-related medical issues, she was skipping on treatment because of the difficulties of travelling. She complained that community transport could not quote for the costs of trips because that depends on where the driver started out from. I told the meeting that restoration of a 141 service of at least two round trips a day is essential to serve both towns and the villages. Although Shropshire Council is reluctant to subsidise bus services, we must continue to press the case. Claverley used to have nine buses a day. Now it has none and villagers find it difficult to get to the 890 service that runs along the main Bridgnorth to Wolverhampton Road. Frank Taylor, who unsuccessfully took Shropshire Council to the high court over the cancellation of Link, told the meeting that he is conducting a survey of former Link users. It was helpful that Arriva sent along a representative along to the meeting. He promised to investigate a number of problems raised about bus drivers “self-regulating” – cutting short or changing routes. He also told the meeting that Arriva had appointed a business development manager who lives in the Bridgnorth area. Madge Shineton (Cleobury Mortimer) and I were the only two councillors present. Madge and a community transport driver pointed out that they are all volunteers. They have done their best since Link was scrapped in a difficult regulatory environment as the community service cannot run against a scheduled route. Local bus champion Les Lumsdon closed the meeting. He said that congestion problems that lead to buses running behind timetable need to be solved. A bus link from Claverley needs providing. He warned that some campaigns take a long time to come to fruition, citing CAMRA and the smoking ban as examples. We need to keep up the focus and pressure for adequate bus services across the county. Les Lumsdon is right. Without buses, people in rural communities who do not drive become isolated. This particularly affects the elderly. The lack of social interaction reduces people’s quality of life. For many, the lack of access to services and growing isolation harms their wellbeing, putting pressure on care and other support services. For these reasons and many more, subsidies for bus services should be seen as an investment, not a cost. (1) The bus seems to run simply to transfer drivers from the Bridgnorth depot to Ludlow to Knighton Service. A ‘ghost’ bus runs without passengers early and late in the day.